Mussels are edible clams, which are rich in vitamins, iodine, calcium, protein, iron and other nutrients. In addition, they are rich in carbohydrates and fats, making them extremely nutritious dish. To frozen mussels have not lost most part of its composition, they need to properly prepare. Cooked frozen mussels you can just reheat or boil in a little water for 5 minutes. Raw frozen mussels should cook for 7 minutes – they cannot be frozen again because shellfish are highly perishable. To defrost untreated mussels, you need to leave them on the air, then thoroughly rinse under cold running water to remove the sand and remains of algae, and for several minutes to boil them in plenty of water. When choosing frozen mussels, it is important to ensure that inside the package avoid drips of liquid. Cooked mussels again dipped in cold water, then bring to a boil – it allows to preserve all vitamins and microelements contained in the clams and remove all the toxic substances. 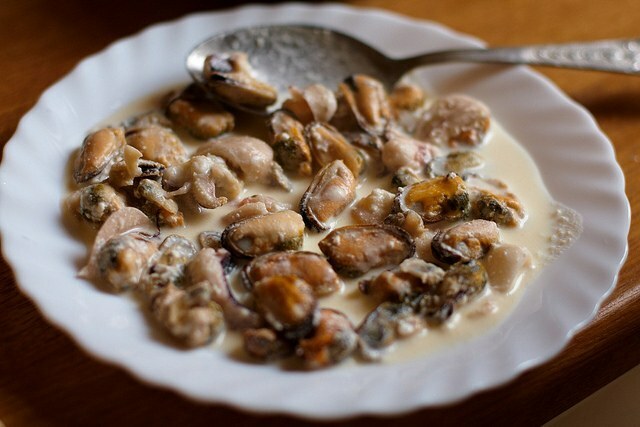 After boiling, mussel shells themselves will be revealed, and the meat will be easy to get hold of them with a knife. Frozen peeled cooked mussels in cold salted water – their readiness, they reach after the water boils and covered with film. Long to cook mussels is impossible, otherwise their meat will become tough and will lose their entire benefit. One of the most simple and quick recipes for cooking frozen mussels are mussels in Korean. For this you will need 500 grams of mussels, the packaging of the Korean carrots, 3 onion onions, 50 milligrams of soy sauce, 1 tablespoon of salt and a little nutmeg, coriander, chilli and black pepper. First you need to defrost the mussels and rinse them under cold running water and then boil for 5 minutes and drain in a colander to drain the water. Ready mussels should be cleaned from shells and cut into half rings onions, which is salted, lightly sprinkled with lime juice and leave to marinate. Until the onions soaked with the marinade, add soy sauce nutmeg (just a pinch) and other spices to taste. Then the clams, sauce and onion mix in a bowl, sprinkle red pepper, mixed again and put in the fridge to cool, because mussels in Korean use exclusively cold. To the table ready dish is served with Korean carrot. You should know that a large amount of sauce or seasonings will kill or will spoil the original flavour of the mussels.